Everything Rachael Ray: Talk Amongst Yourselves: Is Rachael Ray the Next Oprah? 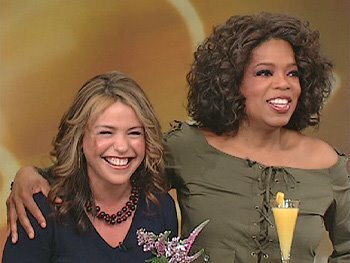 Talk Amongst Yourselves: Is Rachael Ray the Next Oprah? Usually, the question is whether Rachael Ray is the next Martha Stewart. I think we can all happily conclude that the answer to that is no, considering that Rachael is a self-professed goofball who avoids cooking for more than 30 minutes whenever possible. Have you ever seen Martha try to carry a dozen things from her pantry to the counter on TV? Didn't think so. Is Rachael Ray the next Oprah? In the past week, Rachael Ray was not only named one of People Magazine's Most Beautiful People but also appears on Time Magazine's List of 100 People Who Shape Our World. (Oprah also appears on both lists.) Like Oprah, Rachael has her own magazine (recently launched), Everyday with Rachael Ray, chocked full of not only cooking tips but lifestyle and fashion advice. And coming this fall, Rachael Ray will host her own daytime talkshow, developed by (you guessed it) Oprah Winfrey. Who is this woman that has taken America by storm? Cooking purists may loathe her kitchen skills (or lack thereof) but personality goes a long way and that is one thing she is not short of. If we are truly lucky, perhaps Rachael's talkshow will be a success (good news for her fans), but she will step aside from her cooking duties (good news for her critics). Regardless, Rachael Ray has definite appeal to the masses and you can expect to see her around for a very long time. Ummm, hello? Rachael should step aside from what has made her wildly popular? I think not. PS - How did I miss it that Rachael Ray was named one of People's Most Beautiful? There is no full list on the People site, so I can't confirm it. Is this what I get for only reading US Weekly?